Wildlife Vets International is providing the essential veterinary support for the Pine Marten Recovery Project. In 2015 we helped Vincent Wildlife Trust and partners move 20 pine martens from Scotland to Wales. In early 2016 we had proof of successful breeding. The pine marten was once the second most common carnivore in the British Isles. Yet a hundred years ago their numbers had dropped dramatically to dangerously low levels, thanks to deforestation, the activities of gamekeepers and hunting for fur. As a result, by the end of the 19th Century pine martens could be found only in shrinking numbers in remote areas of England and Wales. Thankfully they have made a comeback in the Scottish Highlands. 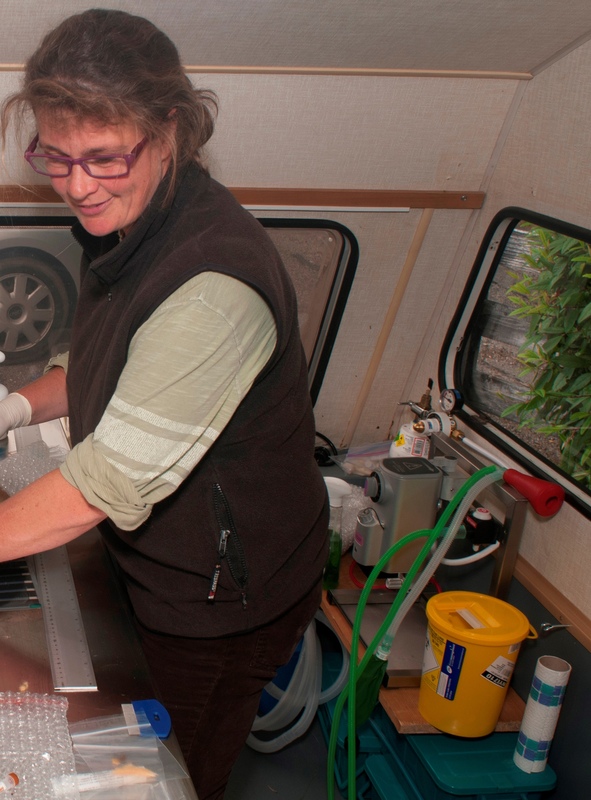 Today WVI is providing the essential veterinary support to the Pine Marten Recovery Project. Pine martens are taken from Scotland and once past vigorous health checks, are released into suitable Welsh habitat. The aim is to boost the number of pine martens in Wales and give the species a real chance of recovery there. If you would like to help WVI rescue this rare and charismatic animal from extinction in England and Wales. Pine martens, once one of the British Isles’ most common carnivores, are now the rarest wild carnivore in England and Wales. Restoring their numbers is an important step in re-establishing the UK’s native wildlife. The great news in 2016 is that the first group of martens is already breeding successfully. In Scotland, however, the pine marten is fairing better. The population is currently increasing naturally and recolonising its original range. In 1995 it was estimated that there were about 4,000 animals left in the UK, mainly in the Scottish Highlands. It has been a protected species since 1988. In Scotland however, the pine marten is fairing better. The population is currently increasing naturally and repopulating its original range. In 1995 the UK population was estimated at about 4,000 animals. About the size of a domestic cat, the pine marten has a distinctive creamy yellow bib, bushy tail and large rounded ears. Related to the badger, weasel and otter, they are very agile and amazing climbers. They prefer to live off the ground and often make dens in tree cavities or old squirrel dreys. Usually solitary and predominantly nocturnal, pine martens like woodland habitats, but can also be found in scrub, rocky areas and among mountain crags. In 2014 the Vincent Wildlife Trust began a six year initiative, the Pine Martin Recovery Project, to help bolster pine marten numbers in Wales. Two years of extensive research and feasibility studies preceded its launch. 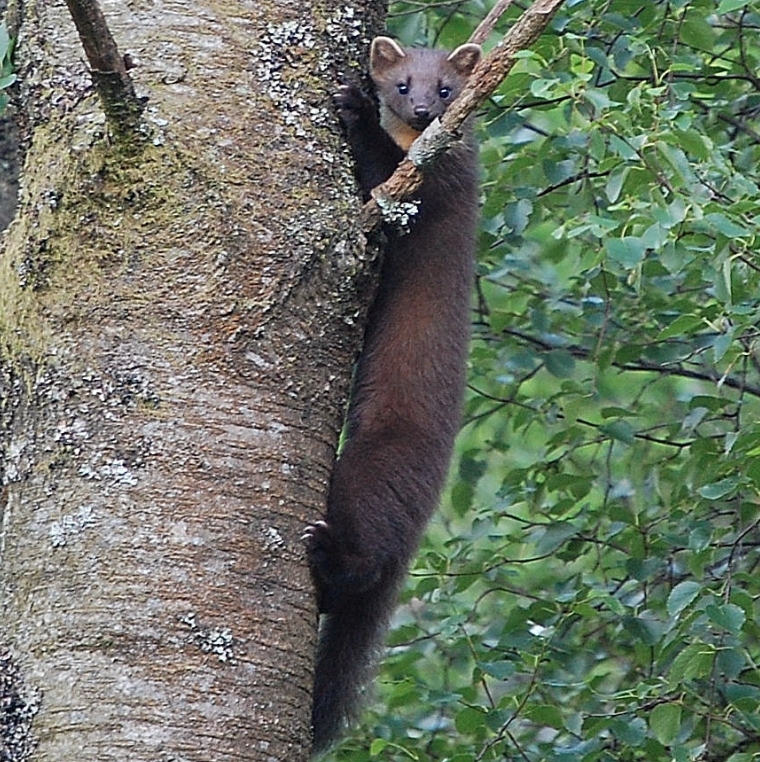 The project is currently focused on taking a number of healthy adult pine martens from two locations in Scotland, where the species is thriving, and translocating them to carefully selected new sites, in mid Wales. Although there are some pine martens left at these sites, the introduction of new individuals of breeding age would make these populations much more genetically and demographically sustainable. Health and disease assessment is a fundamental part of any wildlife translocation project (See IUCN Guidelines). With its successful record of carrying out health surveillance in endangered species across the world, WVI was very well placed to take on this role for the Vincent Wildlife Trust. Wildlife Vets International is responsible for the essential veterinary aspects of the programme; from taking care of the health and welfare of the individual pine martens as they are captured and prepared for their move south, to devising a comprehensive disease surveillance programme so that the health of the translocated martens, and of other animals in their immediate environment, can be monitored over the long-term. Early indications are that the first group of pine martens translocated in 2015 are doing very well. If the project proves a success, it will provide a template for supplementation of small pine marten populations in other areas of England and Wales in the future. In the longer term, it would be possible to reintroduce pine martens to areas where they have completely disappeared. Pine marten numbers in England and Wales remain low. Current threats to their survival include roads and railways, hunting and trapping, and recreational activities which encroach on their habitat. They are shy and elusive animals and very sensitive to human activities in their environment. The Vincent Wildlife Trust wants to see healthy pine marten populations restored to England and Wales. They are currently involved in capturing martens in Scotland, where the species is doing very well, and releasing them at carefully selected sites in mid Wales. The Trust is also working hard to engage stakeholders and local residents, recruiting volunteers to go into the field to help with monitoring, and dispelling myths around various carnivores. The role of Wildlife Vets International is to make sure that the health and welfare of the captured pine martens is given priority at every stage of the translocation process and that there is good understanding of the possible threats from disease that might arise at the new location: both threats to the pine martens themselves, and any that they might bring with them that could affect other species in the local ecosystem. It is essential to the success of a translocation project like this that the risk of disease is assessed, understood and minimised. Otherwise, it can completely undermine the success of a conservation project. This is an area in which Wildlife Vets International can offer unique assistance, having produced the only comprehensive disease risk assessment for the translocation of a large carnivore to date, through our work on the proposed reintroduction of the Amur leopard in the Russian Far East. A comprehensive disease risk assessment safeguards not only the health and welfare of the pine martens, but of other wildlife, livestock, pets and humans. It takes into account the potential impact of any disease that might be brought to the new area as a result of the pine martens’ release. The Vincent Wildlife Trust Pine Martin Recovery Project is planned to run over a period of six years, from 2014 to 2020. The central pillar of the plan involves two translocations, each involving 20 pine martens, from Scotland to Wales. The first of these was successfully completed in 2015 and is now being carefully followed up. Seventeen of the twenty pine martens released have successfully established themselves in Wales. The second translocation is planned for autumn 2016. Wildlife Vets International is providing a range of veterinary assistance to the project. Carried out a Disease Risk Analysis for the translocation, before the first group of pine martens was caught and released. Provided veterinary expertise during the trapping, handling, anaesthetizing and radio collaring of the first group pine martens, making sure that the health and welfare of the every animal was given top priority. Screened the martens that were trapped in 2015 to make sure they were fit and healthy, and of the right age to be appropriate choices for translocation. This involved giving them clinical examinations, checking for specific diseases, and advising on suitable means of transport. Developing a comprehensive disease surveillance strategy to monitor diseases in the new habitat. This work started in 2016 and will continue until the completion of the project in 2020. Facilitating research into endemic diseases normally found in wild pine martens, and identifying new emerging diseases which could affect their numbers in the future. Having begun in 2015, this work will also continue until 2020. In October 2015, twenty Scottish pine martens were carefully caught, health screened and fitted with radio collars before being released in pre-selected sites in Wales where there is suitable habitat. The team from the Vincent Wildlife Trust follows the released pine martens closely, radio tracking them daily and using remote cameras to record their behaviour and movements. As a result, in May 2016 the Vincent Wildlife Trust was able to confirm that at least three of the ten female pine martens have given birth. Between them they have at least five kits. This is fantastic news for all concerned, and a very significant step in re-establishing the pine marten as an iconic woodland species in the UK. Another twenty are due to be translocated in 2016. Updates and more information on the project can be found here. WVI has been able to provide full veterinary support for this project and will be involved in all aspects of its continuation.